Remember when I wrote that thing about wanting to be blonde? I officially revoke my previous comments; months of talking to my sister about her feelings on the many different shades of blonde she’s had conferred upon her head for this column has singlehandedly disabused me of the belief that being blonde is all breezy fun. No – being blonde is a bloody nuisance and a financial drain. And rife with complexities – while bleach may look great at first, after a month it looks like a bale of hay. Equally, go too dark, and you’ll hate it when you first leave the salon. ‘As those of you who’ve read about the highlights I had at Easton Regal will know, I was extremely pleased with the job they did. My hair looked great for a month – bright, happy-making blonde. 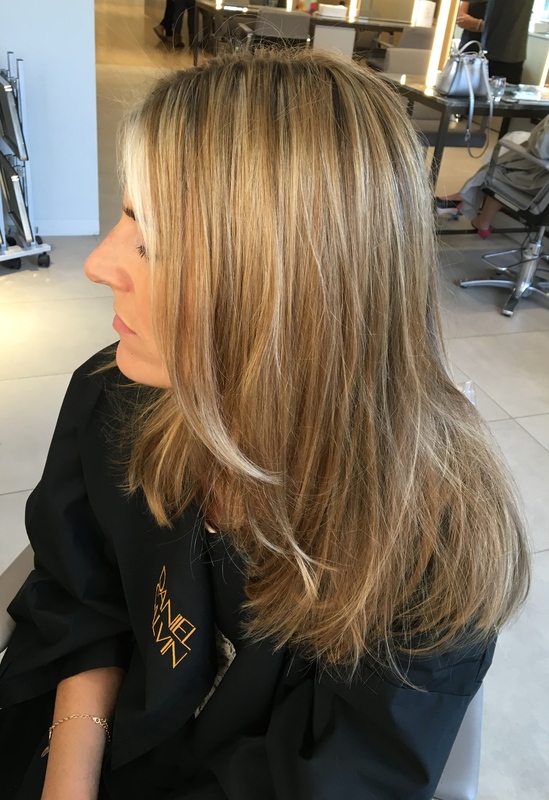 Having so many highlights has a flip side, though – it only took about six weeks for my regrowth to be very visible and after an episode in the sun where the colour lifted, it all started to look a bit brassy. Mad mentioned that Daniel Galvin were offering something called ‘ Vacation Blonde‘ at their Selfridges branch, so I looked into it. In a nutshell, you choose a blonde based on the colour you like to be. I liked this approach as it’s a lot more simple to navigate than the usual hairdresser lingo – Ibiza, St. Tropez, Caribbean and Venice Beach all offer a different finish and all you have to do is choose which one sounds best to you – no ‘half head/balayage’ terminology in sight. I plumped for Venice Beach, which is the surfer girl look with a lot of natural warmth and some sun kissed accents around the face. My colourist, Anna Short, agreed with my choice, telling me that it would be perfect to take down the blonde in the lengths while keeping me highlighted and therefore happy.